All photographs by Gerry Dawes©2016, unless otherwise noted. Agustí Torelló Mata, winemaker-partner at D. O. Clàssic Penedès AT Roca, showing the winery's different vineyards and varying altitudes. At a tasting at Hotel Majestic in Barcelona, October 17, 2016. I phoned my friend Agustí Torelló Sibil, who with his son, Agustí Torelló Mata, produces AT Roca, splendid sparkling wines (a Brut Reserva and Brut Rosat Reserva that are of Champagne quality), plus several first-rate still white wines from Penedès and an excellent red Montsant from the neighboring province of Tarragona. AT Roca, along with some 12 dozen other small producers, recently left the D.O. Cava to make wines under the more exclusive Clàssic Penedès designation. 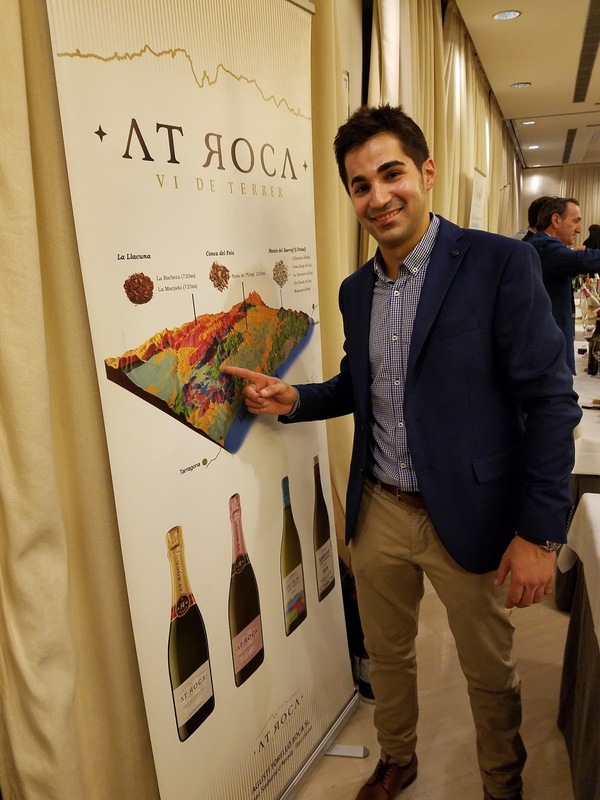 Agustí Torelló Sibil, who with his son, Agustí Torelló Mata, produces AT Roca, splendid sparkling wines (a Brut Reserva and Brut Rosat Reserva that are of Champagne quality). We didn’t get much sleep at the Pensión Casablanca, because the pavement pounding going on below, but had at least given us a place to stash our luggage, had allowed a partial nap, was a place to shower and did not cost a fortune, even considering that we didn’t spend the night. We showered and dressed, checked out, went down with our luggage to the Vía Layetana to catch a taxi to Hotel Majestic to drink some more sparkling wine, in this case, the superb Clàssic Penedès designation AT Roca Brut Reserva 2013 and AT Roca Brut Rosat (Rosé) 2013, both made by impeccably done methode champenoise production standards. AT Roca is an artisan, family owned, viticulturally oriented winery, producing superb quality Clàssic Penedès Brut and Brut Rosado sparkling wines. Agustí Torelló Sibil and his sister Lali were shut out of their father’s family winery Agustí Torelló because of a family dispute. Agustí, who was the face of the family’s wines, decided to begin anew. 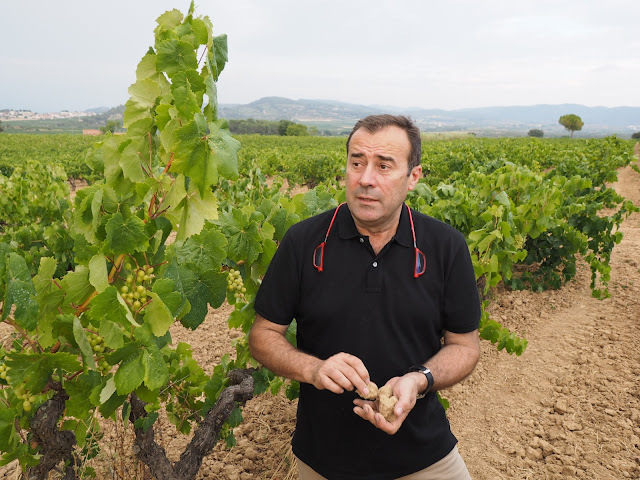 Agustí, Lali and his son and winemaker Agustí Torelló Roca, set up shop on the outskirts of the Cava capital of San Sadurni D’Anoia, where some 90% of Spain´s sparking wines are made. They named their wines AT Roca, since they winery owned by the family patriach owns the name Agustí Torelló. The Torellós also found three prime ecologically farmed vineyards, owned by eight dedicated viticulturists with mature vines from which they source their grapes in three different areas of Penedès at three different altitude levels: Their Macabeu (Viura) grapes come from L'Ordal (coastal Massís del Garraf), Finca Canta Llops (Howling Wolf) vineyard, 420 meters (nearly 1400 feet above sea level); Xarel·lo from the slate-laced vineyards of Conca del Foix, Plana de l'Urpí, 220 meters (more than 700 feet); Parellada from La Llacuna, La Ginestera, 725 meters (2400 feet). Brad and I spent two hours at the tasting, half behind the AT Roca stand at the event. I am comfortable enough with the wines and I speak fluent Spanish, though no Catalan, but with Brad´s help with the pouring I manned the stand while the two Agustís "worked" the busy room. At 9:00 p.m. the tasting was over. 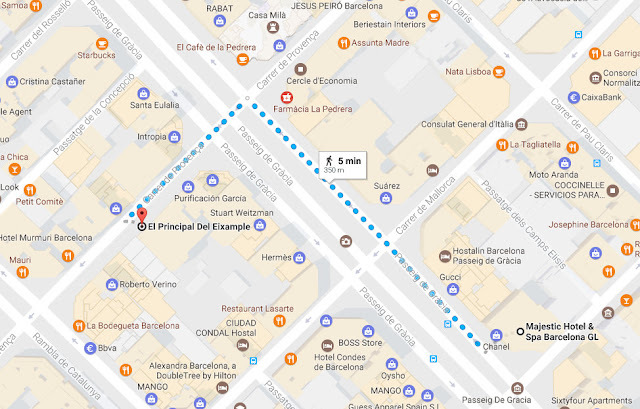 We helped the Torellós pack up, then strolled up the Passeig de Gracia, the elegant main divided boulevard the bi-sects Barcelona's tony Eixample district, towards El Principal del Eixample, Carrer de Provença 286 - 288, 08008 Barcelona; T. 93 272 08 45, an elegant new Catalan market cuisine restaurant. Along the way, we passedg one of my long-time favorite hotels, the Condes de Barcelona, and taking in one of celebrated turn-of-the-19th Century Catalan architect Antoni Gaudí's most spectacular buildings, Casa Mila, popularly known as La Pedrera, which translates unjustifiably into "the rock pile." Hotel Majestic to Restaurante El Principal del Eixample, Barcelona. Casa Mila, "La Pedrera," Passeig de Gracia, Barcelona. Agustí Torelló Sibil has long been a wine celebrity in Catalunya and the rest of Spain, so he gets red carpet treatment for himself and his guests almost any place he goes. He has long been one of my favorite people in the wine trade in Spain and we have been friends for at least 20 years, so it was great to be having dinner with him and his son, whom I had not met until this evening. El Principal restaurant is a sprawling space with a charming enclosed terrace, accessible from the interior dining rooms. This is a fancy restaurant that can accommodate up to 500 people for a cocktail party, but with a panel system that allows the space to bee divided off into smaller more intimate venues. The food was modern with creative, but sensible riffs from chef-owner Joan Ferrè, who spent 25 years cooking the Tragaluz restaurant, which has some 20 restaurants in Barcelona, Girona and Madrid. We began with a plate of superb Anxoves del Xillu, coca amb tomàquet (Anchovies “del Xillu” [a legendary store in L'Escala, a town famous for its cured anchovies and its Greek and Roman ruins on Catalunya's Costa Brava]), which were served with Catalan flatbread with tomato, pan con tomate style; not shown). 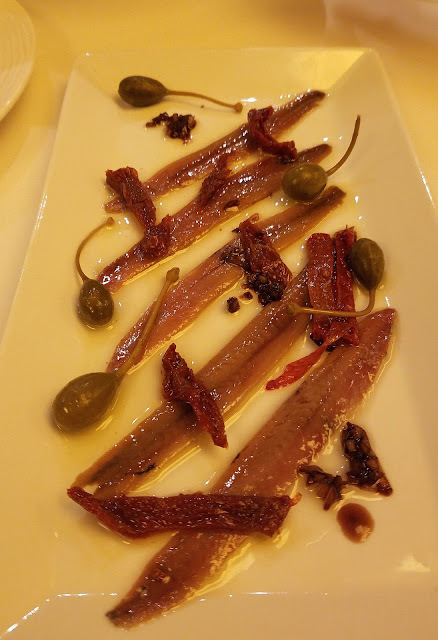 At nearly four Euros a piece, these cured anchovies are a luxury menu item. Anxoves del Xillu, coca amb tomàquet (Anchovies “del Xillu” [a legendary store in L'Escala, a town famous for its cured anchovies and its Greek and Roman ruins on Catalunya's Costa Brava]) at Restaurante El Principal in Barcelona. We were sharing all the dishes here. 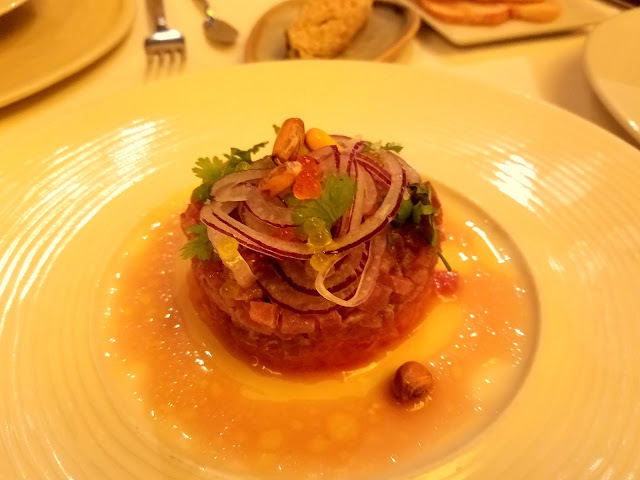 Next was a tartar de tonyina, tomàquet picant, gingebre i caviar d’oli or tartar de atún , tomate picante, jengibre y caviar de aceite<(tuna tartar with spicy tomato, ginger and spherified olive oil "caviar." Tartar de tonyina, tomàquet picant, gingebre i caviar d’oli or tartar de atún , tomate picante, jengibre y caviar de aceite (tuna tartar with spicy tomato, ginger and spherified olive oil "caviar." 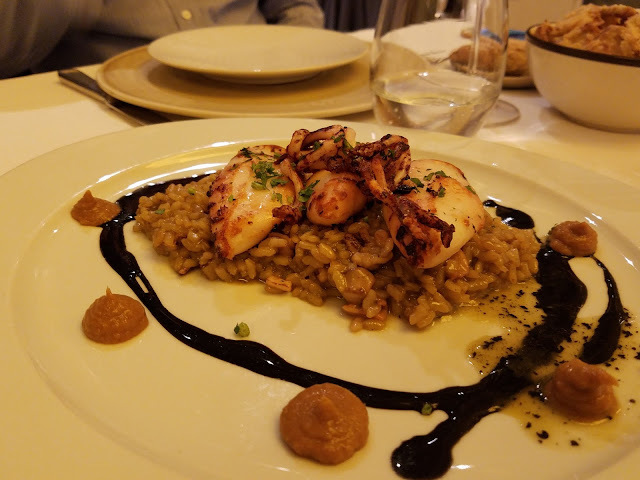 Then we were served a very good rice squid dish--Catalans do great things with squid and sepia--Calamar, ceba confitada, arròs de julivert i festucs; Calamar, cebolla confitada, arroz de perejil y pistachos; Squid with caramelized onions, served on rice with parsley and pistachios. Calamar, ceba confitada, arròs de julivert i festucs; Calamar, cebolla confitada, arroz de perejil y pistachos; Squid with caramelized onions, served on rice with parsley and pistachios. Arròs de llebre i carxofes Arroz de liebre y alcachofas en paella, Rice with hare/rabbit and artichokes, our final course, was exceptional. We drank the wines of the Torellós, including the AT Roca Brut Reserva 2013 and a delicious, not over the top in either high alcohol (miraculously under (14%) or new oak, Sileo Vi Negre (red wine) they make in D.O. Montsant. 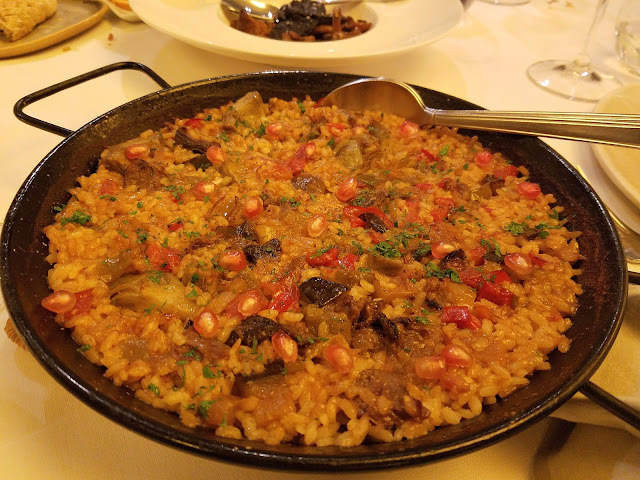 Arròs de llebre i carxofes Arroz de liebre y alcachofas en paella, Rice with hare/rabbit and artichokes, our final course, was exceptional. In this day alone, Brad Haskel and I flew in from New York, experienced a four-hour plus "Breakfast of Champions" at La Boquería market, strolled the old Gothic Quarter of Barcelona, grabbed a nap of sorts, went to a wine tasting at Hotel Majestic and even poured wines at the event, had dinner with Agustí Torelló and his son and rode an hour southeast of Barcelona to Hotel Domo in Vilafranca del Penedès (Barcelona province), arriving at sometime after one a.m.
Hotel Majestic, Barcelona to Hotel Domo, Vilafranca del Penedès. The Hotel Domo was relatively quiet, at least for a Spanish hotel and I could open my windows for fresh air. Agustí Torelló Roca, the son, told us he would be by at 9:00 the next morning to show us some of the AT Roca vineyards, their fine vinification facility at Can Bonastre and the Caves, where they age their wines. 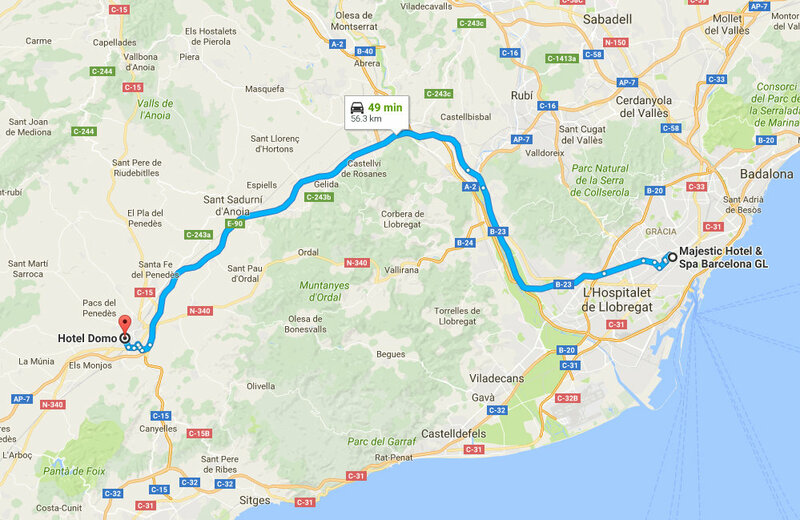 Then he would take us to meet up with the Spanish National Tourist group at the Cava Museum in Sant Sadurni d'Anoia. It had all worked out much better than we could have imagined. 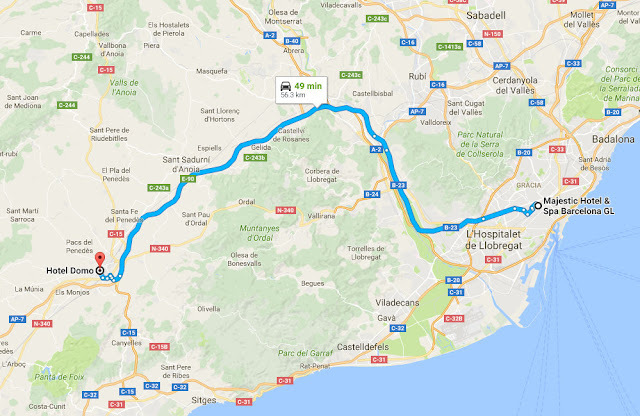 We would not have to catch a very early train from Barcelona to Sant Sadurni, dragging our luggage with us and we were being provided with a ride to catch up with the group. Except for that damned jackhammer machine, life was good to us today!